Review posted March 31, 2015. Schwartz & Wade Books, New York, 2015. 40 pages. This book has a quiet cover that doesn’t reach out and grab you, but if you open it up and start reading, it’s wonderful on so many levels. The subtitle tells you what’s going on. 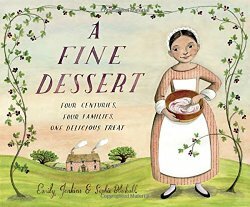 This book looks at families from 1710, 1810, 1910, and 2010 – all preparing and enjoying the same dessert, Blackberry Fool. All the kids who help get to lick the bowl at the end. The dessert is the same in each century. But how it is prepared is quite different. How do they get the blackberries? Pick or purchase? And where do they get the cream? Whipping the cream changes completely each hundred years – first, a bundle of twigs, taking fifteen minutes, next a wire whisk, taking ten minutes, then cast-iron rotary beaters, taking five minutes, and finally an electric mixer, taking two minutes. How they chill the dessert changes each century as well, as does the food they eat for supper before the fine dessert is served. Another contrast is that it isn’t until 2010 that a man and his son do the food preparation. In 1810, a slave girl and her mother do the work. But the daughter still gets to lick the bowl. This book is gently written, with wonderful detailed pictures. It is as irresistible as the fine dessert! The recipe for Blackberry Fool is at the end of the book.